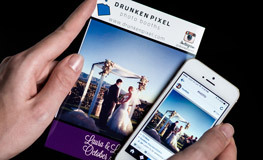 Drunken Pixel offers photo booth rentals for weddings, birthdays, baby showers, bar mitzvahs, bat mitzvahs, corporate events, holiday parties, and many other celebrations in the greater Seattle area. Our service area includes Seattle, Bellevue, Tacoma, Everett, and surrounding cities. We have many unique options for customization including photo booth backdrops, print layouts, custom logos, props, and more. We also offer Instagram & Facebook options, which are great to capture your event or even for brands trying to build their social media presence. We offer event photography that can be in combination or separate from a photo booth.